Can Amazon democratize the Whole Foods experience without sacrificing standards? It’s a question analysts ask. It’s tempting to imagine the merger of Amazon and Whole Foods as fodder for a technological experiment: What if you could simply ask Alexa for organic kale and have it delivered by drone in minutes? But in the days since the tech giant announced it was buying the grocery store chain, experts in the food industry have begun to speculate about the cultural implications of the sale, and what a merger of Amazon’s customer-centric ethos with Whole Foods’ high-minded approach to food might look like. Long before we see drones taking off from Whole Foods’ rooftops, however, we’re likely to see the expansion of Amazon’s Prime memberships, VanAmburg said, enabling people who pay the $99 annual fee to get access to in-store coupons, deals, and better prices at Whole Foods than nonmembers. And while that might not seem much different from a traditional supermarket loyalty program, the distinction comes from Amazon’s deep understanding of shoppers’ habits. After all, this is the company that just incorporated its Alexa artificial intelligence technology into its fridge-friendly Dash Wand device, allowing you to both speak and scan barcodes to update your grocery list. Amazon dominates the Web in online sales, but getting information about our in-store purchases has always been beyond its reach. Now, if Amazon knows that you bought eggs and peanut butter from the physical store, it could ping you when it suspects you’re about to run out. And if you’re too busy to get to the store? It will happily replenish your pantry with a delivery from Amazon Fresh, the company’s existing grocery delivery and pickup service. Doug Rauch believes we’re willing to let companies know quite a bit. The former president of Trader Joe’s, who now runs the Daily Table grocery store in Dorchester, said that Amazon’s “maniacally customer-focused” culture has already changed our shopping habits, in part because the company’s data collection benefits the consumer, such as with the “related items” and “customers also bought” suggestions online. With personalized digital insights, Rauch said, the “treasure hunt” aspect of grocery store shopping, or the ability to lure customers into making impulse purchases, can begin much earlier, with e-mails about new products available in-store or online. “There might be a whole new relationship created with the customer and their food that may not have been crafted so easily or quickly,” he said. One possibility? A hybrid Whole Foods/Amazon store model might make picking out sundries far less cumbersome (particularly if you dread weaving a cart up and down the aisles). Shoppers have been hesitant to buy perishable items online, but Rauch envisions a system in which they pick out dry goods in advance — think boxes of Hamburger Helper or tuna fish cans — and then show up at the store to select meats, dairy items, fruit, and vegetables. At the check-out, the tuna and other such items are prepackaged and waiting. The question that has been asked widely among industry insiders is whether Amazon’s approach to pricing will bring down Whole Food’s sky-high receipts. 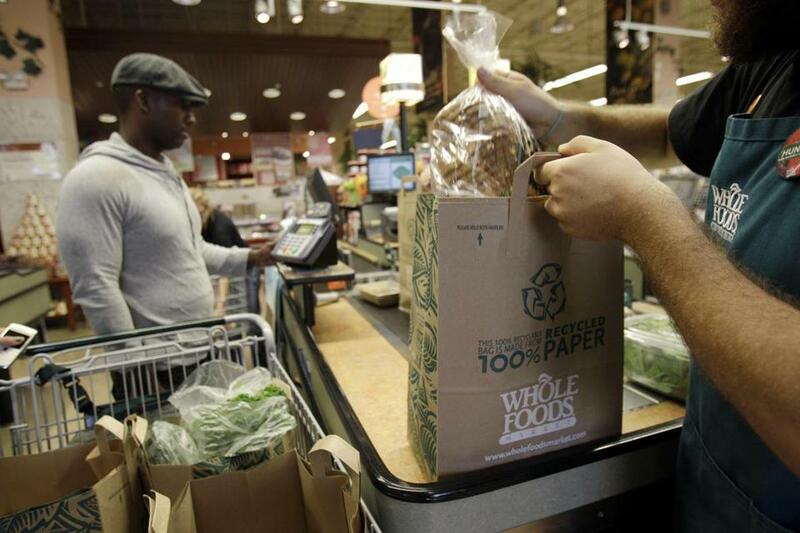 After all, Whole Foods is the store that the public loves to shop at but hates to pay for. So can Amazon democratize the Whole Foods experience without sacrificing their standards? Early signs say yes. And no. William Masters, an economics professor at Tufts’ Friedman School of Nutrition Science and Policy, said that the core values Whole Foods promotes — like its focus on high-quality natural and organic products, environmental stewardship and healthy eating, and its relationships with suppliers — might take a hit. Instead, he expects to see a broader range of products in stores that may not be local, organic, or sustainable. That would help bring down prices, as would the behind-the-scenes mechanisms that Amazon employs in its supply chain, like warehouse automation and buying in bulk. Another component that would help cut the prices consumers pay? Amazon’s ability to manipulate prices depending on circumstances: upselling for home delivery, for example, or trimming costs when a shopper places a recurring grocery order. There is proof that as part of its effort to take on Walmart, Amazon has begun to focus on targeting a demographic with far less spending power than a typical Whole Foods shopper. Shortly before news of the Whole Foods deal broke, the company announced it was creating a low-cost Prime membership for $5.99 a month for people who use government food-assistance programs. Some, like John Foraker, president of the organic food company Annie’s Inc., suggested this could solve the problem of“food deserts” by allowing healthy food to reach a much wider audience, and at lower prices. “When you combine [Amazon’s] delivery infrastructure with Whole Foods’ 450+ stores and organic food supply chain, you enable the delivery of natural and organic foods to most places in the US in a matter of an hour or two,” he wrote in the days following the announcement. But farmers remain skeptical that such measures won’t cut into their own margins. Dave Chapman, an organic farmer in New Hampshire who sells his tomatoes at Whole Foods, worries that Amazon will drag down the company’s principles in pursuit of lower prices. An Amazon spokesperson said the company plans to continue to work with farmers. “We will want Whole Foods to keep doing what it does best, including working with small farms and producers to bring the best natural and organic foods to customers,” the spokesperson said. Over time, the biggest impact may be in the way Amazon gradually shifts the way shoppers feel about patronizing Whole Foods. Perhaps offering better service, lower prices, or a mission that offers greater access to a wider swath of the public will create a different emotional response in customers, as opposed to the knee-jerk guilt or exasperated sticker shock that many experience at the register. In short, can Amazon help us to hate ourselves a bit less when we fill up our reusable bags at the checkout?